Last Friday, part of Bill C-24 went into effect, officially creating a two-tier citizenship system. As a result of this new law, dual citizens and people who have immigrated to Canada can have their citizenship taken away while other Canadians cannot. The government’s press release last week tried to justify this discriminatory law by raising the threat of “jihadi terrorism,” but Bill C-24 could easily be used against non-terrorists—for example, a journalist who is convicted of a “terrorism offence” in another country for reporting on human rights violations by the government. Under this law, the only Canadians who can never lose their citizenship are thos e born in Canada who do not have another nationality (and are not eligible to apply for another nationality). No matter what crimes they may be accused of, these first-class citizens can never have their citizenship taken away. On the other hand, Canadians with another nationality (and those who are eligible to obtain another nationality) now have second-class status, even if they were born in Canada: under Bill C-24, their citizenship can be stripped. 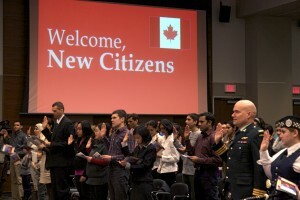 Currently, citizenship can be taken away mainly on the basis of crimes that are considered threats to Canada’s national security, like terrorism or espionage, or demonstrations of disloyalty to Canada, like treason. But legal experts warn that the list of offences that could lead to the removal of citizenship might be expanded in the future. Additionally, Bill C-24 punishes criminal activity with exile – a practice abandoned hundreds of years ago that has no place in today’s democracy. The government has created an infographic to explain the new citizenship stripping process. There’s one change that really stands out for us in this diagram: the absence of a judge in the new system. The government seems to think that removing the judge improves the process, but we would argue that this makes the process unfair and likely unconstitutional. Dividing people into different classes that receive different treatment under the law is unfair and un-Canadian. Bill C-24 has turned millions of Canadians into second-class citizens with reduced rights—and as a result, has reduced the value of Canadian citizenship. 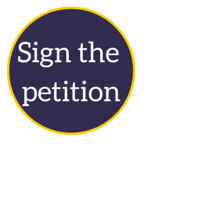 We encourage you to share this petition with your friends and family and to let them know about these important changes to the very foundations of citizenship in Canada. 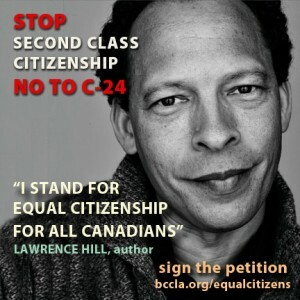 Let’s say no to second-class citizenship! When Bill C-24 was passed last year, we announced our intention to challenge this law in the courts, along with our ally the Canadian Association of Refugee Lawyers. Now that these provisions are in force, we are moving ahead. The BCCLA remains committed to challenging this new law. Be sure to sign up to our list to receive updates on our progress with this court challenge. Update: Due to an overwhelmingly high volume of comments, we have turned off the comment function for this post. However we very much appreciate your feedback, and will take the time to read and respond to the comments we have already received. In the meantime we invite you visit Facebook to engage with us and the BCCLA community on this important topic. Next Post: All votes are equal, but some votes are more equal than others? Bill C-24 will not affect law abiding citizens so what’s the fuss? are we supporting illegal activities? We respectfully disagree. The new provisions allow officials to take away a person’s citizenship based on criminal convictions that occur outside of Canada, regardless whether the regime or judicial system under which the person was convicted is undemocratic or lacks the rule of law. So for example Bill C-24 could be used to strip the citizenship of a journalist who is convicted of a “terrorism offence” without a fair court process in another country, when their “crime” was actually reporting on human rights violations by the government. In addition, citizenship is not a licence the government can revoke for misbehavior; it is the role of the criminal justice system, not elected officials or bureaucrats, to punish people for wrongdoing. Making some people vulnerable to revocation of their citizenship devalues the very meaning of Canadian citizenship, which is something we should all be concerned about. If you have any other questions, please send us an message through the contact us page. Essentially, if you have or are eligible for citizenship from another country then you are could be vulnerable to the citizenship stripping provisions of Bill C-24 (if you are convicted of one of the list of crimes that make citizenship stripping possible or suspected of one of the activities that make you eligible for citizenship stripping such as participating in armed conflict against Canada). This is completely unnecessary because there are already laws for those who break the law! Thank you for taking a stand!